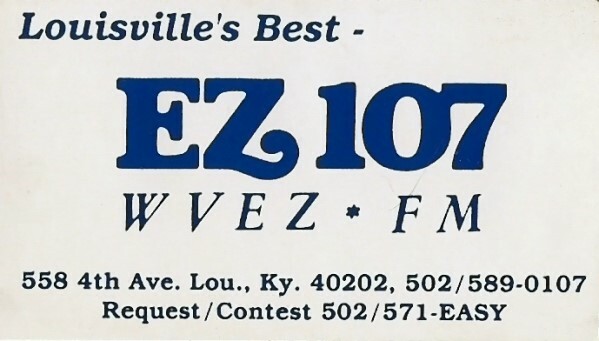 WVEZ Trivia: WVEZ previously was WKRX, run by Keith Reising. It was acquired by Stoner Broadcasting in 1974. By the mid-80s, it became a sister station to WAKY. "WVEZ started life as WKRX after its owner/founder Keith Reising. Keith had worked in Louisville radio for many years being co-owner of WXVW, Jeffersonville before starting WKRX. Bob Craft, who used to do production at Clear Channel Louisville, put together a reunion for the former staff of WKRX-FM (it was great). Among others, Bob, Young Daniel King, and myself were all former staffers. The reunion was held on Sunday August 21, 2005. I had no idea that WKRX had any relation to WAKY but Keith Reising, who started and owned the station, and Jane Vance (Van Vance's ex, Keith's former secretary, and former sales manager at WAMZ) had a very interesting and very funny story to tell. 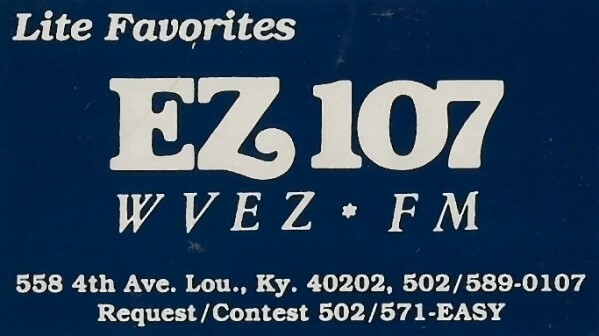 "WKRX 106.9, which later became WVEZ, went on the air in 1966. Keith and Jane told the story of how Keith got the license for WKRX. Keith had been owner of WXVW, a small AM station in Jeffersonville, Indiana. He decided that FM was the way he wanted to go so he sold out, took his secretary, Jane, and worked full time on getting the last full power FM license in the Louisville area. In 1966 after some shake-out, three groups were in the running for the license, Keith: WLKY-TV, and WAKY. "One day Keith invited Jane to lunch at Blue Boar, a popular local chain of cafeteria style restaurants. You entered, picked up your silverware (which was nicely wrapped up in a napkin), and proceeded through the line. Each day some lucky people would get one of several free lunch tickets that were wrapped with the silverware. When they arrived Keith asked Jane if she wanted a free lunch and the two of them began unrolling one set of silverware after another. Soon the manager came and asked what was going on. Keith explained to her that he wanted a free lunch. The manager told him he couldn't do that, unroll all the silverware to get the free lunch, and that he had to stop. Keith asked, 'If I just go on through the line will you let me eat for free?' The answer was no. Keith said, "So what you have here is a lottery." "Blue Boar was a big advertiser on WLKY. Keith had his lawyers pass this lottery information on to WLKY's lawyers since WLKY was advertising Blue Boar and the lottery on the station. Lottery advertising or promotion was forbidden by the FCC in 1966 and interestingly WLKY withdrew its application to avoid problems with the TV station license. "Then it was just Keith. He put his application papers together in a brown paper bag. Jane asked, 'Keith, wouldn't it be better to put those papers in a brief case?' 'No this will be just fine.' He dressed in some old clothes as he headed off to the FCC offices in Washington to see about the license. 'Keith, shouldn't you wear a suit?' 'No, these old clothes are just right,' he replied. So Keith went off looking like a small town boy with his paper sack containing the filing papers for the license. "Later that week Keith came home with the license. Soon after W Keith Reising X went on the air. The little guy had snookered the local group of millionaires who owned WLKY and the mighty Lin Broadcasting who owned WAKY." Know anything more about this station? Have any WVEZ airchecks, photos or promotional material? 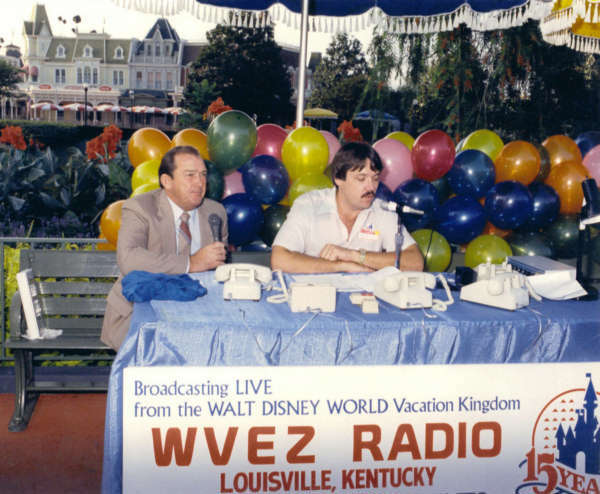 An unidentified Disney employee with WVEZ's Mark Straus broadcasting live from Walt Disney World in 1986. Mark recalls, "Disney flew several of us there, including spouses. It was a great time. Hundreds of stations were broadcasting during that week."